Back in 2011, Snapchat was synonymous with risqué teen behavior. 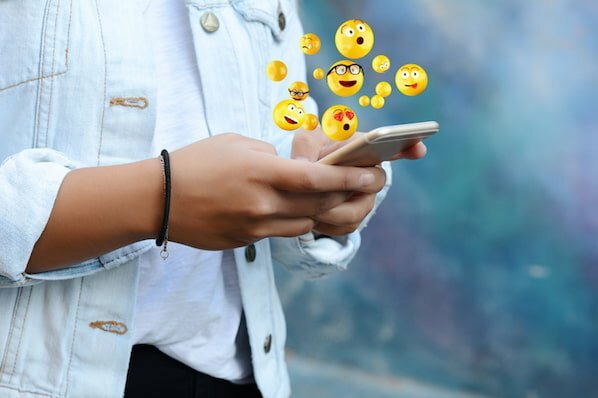 News coverage repeatedly warned parents of the damaging effects the platform might have, and as a result, Snapchat's success wasn't looking good. Since then, Snapchat has evolved into something so much more. 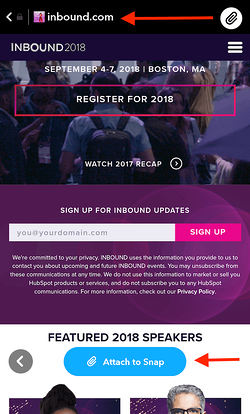 And while it's certainly not the cornerstone of every marketing strategy just yet, the channel has earned a reputation for fast growth and innovation. 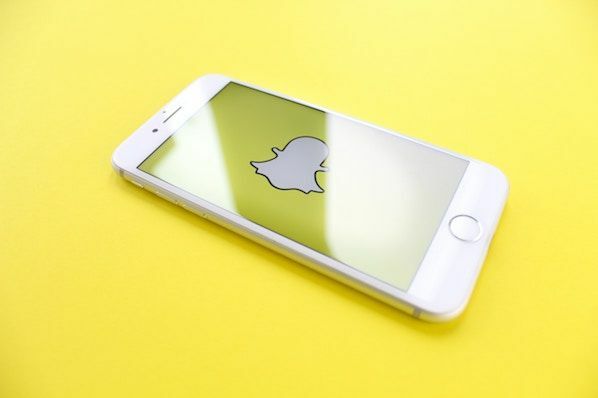 Snapchat is now known as a platform for individuals and brands -- one that allows users to create quick, lighthearted, and even educational video content without using valuable production resources. 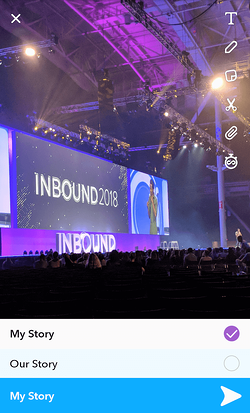 For brands, this means a new opportunity to show off their company culture, share their industry knowledge, and connect with their audience in a new and exciting way. 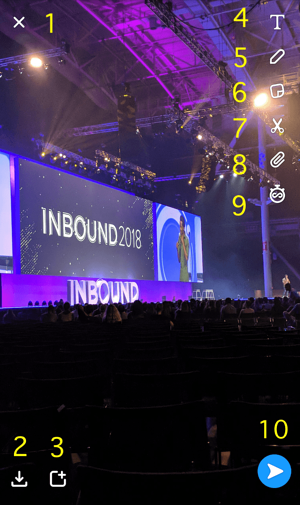 After reporting more than 100 million daily active users and 8 billion video views a day, we decided to give it a go: The official HubSpot Snapchat account launched in March 2016. Since then, we've learned a lot about executing and iterating a successful Snapchat business strategy. 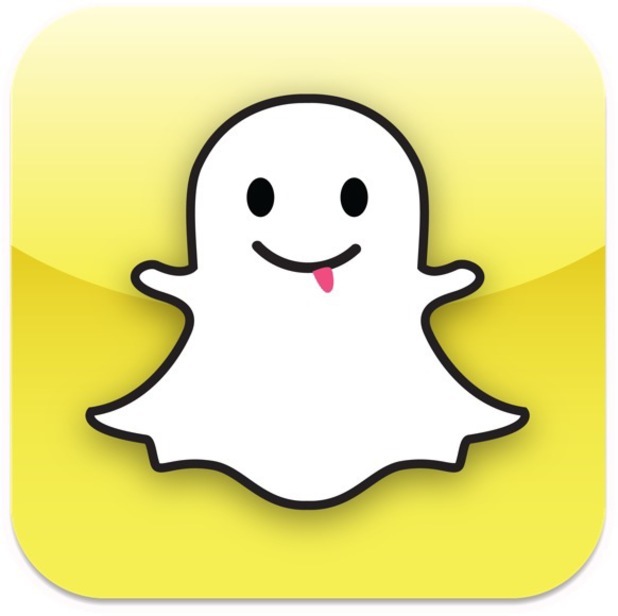 The first thing you’ll need to do is download the Snapchat mobile app -- available for iOS and Android -- and create an account by entering your email, a username, and a password. This will be your personal account, and you can ultimately use it to create a Snapchat Business Account. 1. Sign up on Snapchat's home screen. 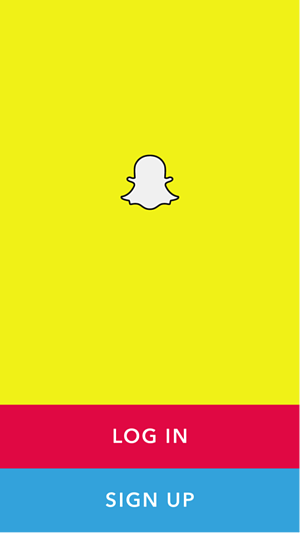 Once you've downloaded the Snapchat mobile app, open it and you'll see the screen below. 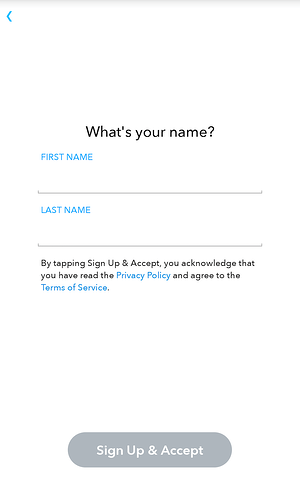 Tap "Sign Up" and the app will take you to the sign-up page, starting with your first and last name. Adding friends from the signup screen will help you find friends on Snapchat who are also in your phone's contact list. You can skip this for now if you wish -- we'll talk more about adding friends in Step 4. When creating a username, however, keep in mind that you've only got one shot: Snapchat does not allow you to change your username once you set it. Once your account is created, you'll want to take care of a few housekeeping things. The first is your profile picture -- this picture will be how people identify you when sending and receiving snaps to and from you. My Friends, indicating that only those you've added as a friend can see your snaps. 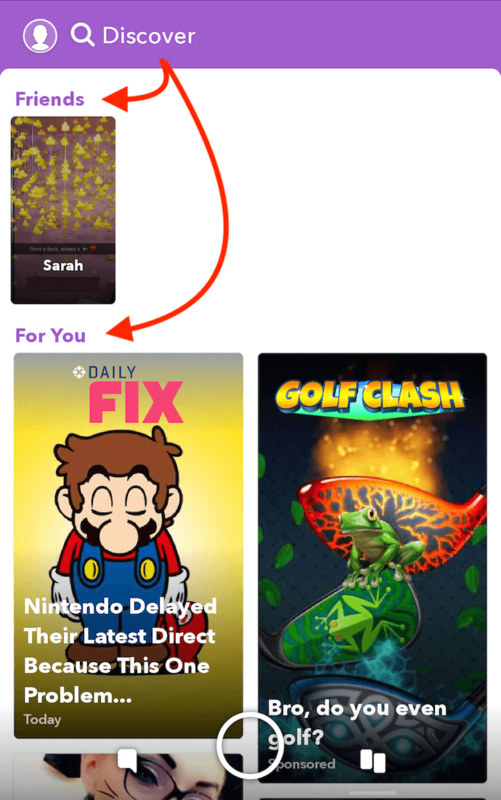 Adding friends in Snapchat allows you to see these users' Stories (a feature we'll talk about in just a minute), and alerts these users that you've connected with them so that they might add you as a friend in return. Contacts. To add friends based on your phone's address book, tap the "Contacts" tab at the top of your screen and select "Continue" at the bottom. 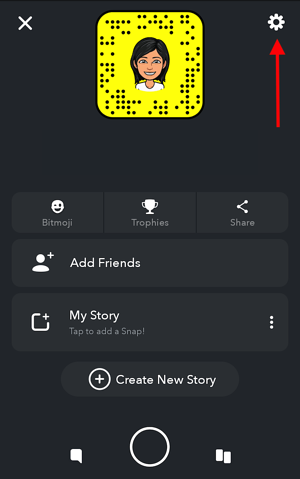 Allow Snapchat to search your contacts in Snapchat by the phone number you have saved on each person, and the app will begin pulling contacts into Snapchat for you to send friend requests to. Snapcode. 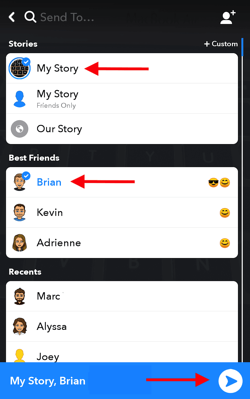 Your Snapcode is contained in the yellow background surrounding your Bitmoji, as you can see in the screenshot above (believe it or not, those black dots embedded in the yellow frame are in a pattern that's unique to your account). 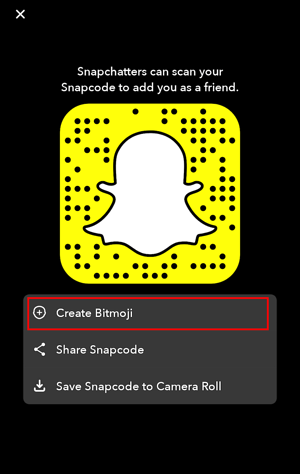 To add someone as a friend by their Snapcode, you'll need to have a picture of this Snapcode saved in your phone's camera roll. Once you've captured this photo, turn it into a Snapchat friend by selecting "Snapcode" at the top of your screen and selecting the photo. Once you've got a photo or video, you have 10 options before you hit send. See an explanation of each numbered icon below the following screenshot. 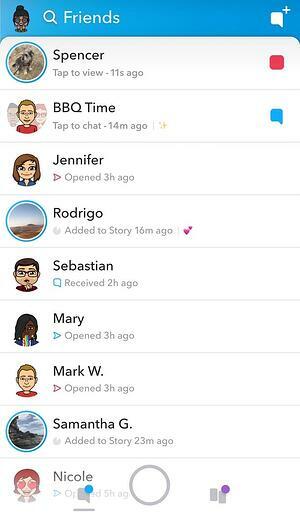 All Snapchat content is ephemeral, meaning the snap either disappears after 24 hours -- if it's added to your Story -- or it's deleted after the friends you sent it to view it. Saving a snap to your Memories, however, allows you to keep the snap permanently and view it in your own private photo gallery. To create a Story on Snapchat, follow the process for creating a Snap in the steps above. When you're ready to send it, tap icon #3, as shown just above Step 1. 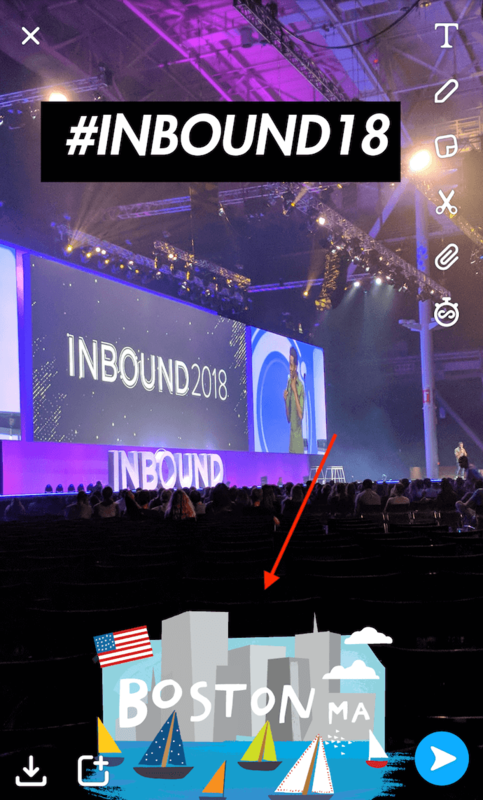 This will present you with the option to save your snap to "My Story," which makes it visible to just those who have added you as a friend; or "Our Story," which adds it to a collection of Stories from other Snapchatters who are in the same location or at the same event. Tapping the paperclip icon gives you a URL search bar. Type in any website's URL, and attach this URL as a hyperlink to your snap for your friends and viewers to click on. This is a great function for businesses to use when promoting content that originates on their blog or website. Tap the stopwatch icon to adjust how long your snap stays on your friend's screen (or plays if it's a video). Your timing options range from one to 10 seconds -- or infinity, which keeps the snap on your friends' screen until they swipe away from the snap. For videos, the stopwatch icon lets you set how many times the video will loop on your friends' screen before the snap closes. Once you're happy with your snap, tap the icon on the bottom-right of your snap. This icon will show you a list of all your friends, where you can select to whom you want to directly send your snap. Then, tap the white arrow on the bottom-right of your friends list to officially deliver your photo or video. This will notify each friend you send it to that they've received a snap from you. 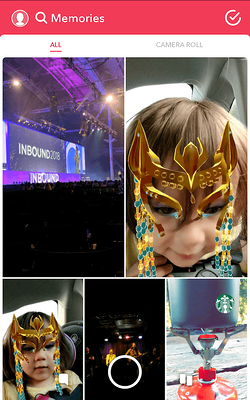 You'll also notice something called Geofilters appear as you swipe through. On-Demand Geofilters are available to businesses and individuals for purchase. To view a Snap that has been sent to you, swipe right on your camera screen to see your Friends list. 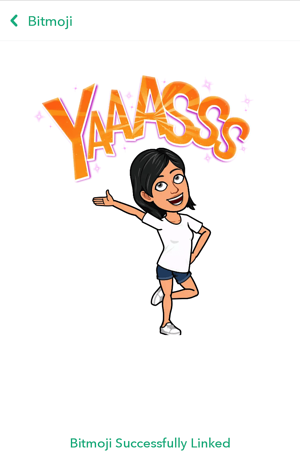 Snaps you've received directly from a friend will have a red (still photo), purple (video), or blue (text message) square to the right of their name. Tap this square once to see or play the Snap. If you have several Snaps from the same friend, they'll play like a flipbook. To view a user's story, swipe left on your camera screen to see a list of your friends. Friends whom you recently interacted with will appear near the top. If they've posted a Story, you'll see it in place of their Bitmoji to the left of their name. Tap the circular icon next to a user's name once to open their story. To view your own Story, tap your profile icon on the top-left on your Friends list. Below your friends' Stories, you'll see a section called "For You." This is where you can view branded Snapchat Stories, recommended to you from Snapchat and created by companies with Snapchat Business accounts. 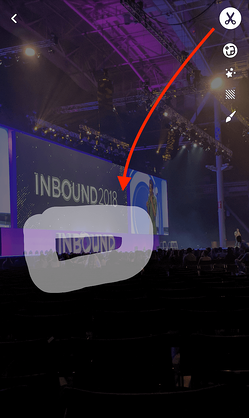 In the section below, we'll talk more about how businesses can use their accounts to garner the most views and appear on their customers' Discover pages. Before you invest in Snapchat marketing for your brand, you'll need to create a personal account. Follow accounts your audience might follow. Add your friends and family. Just start using it. 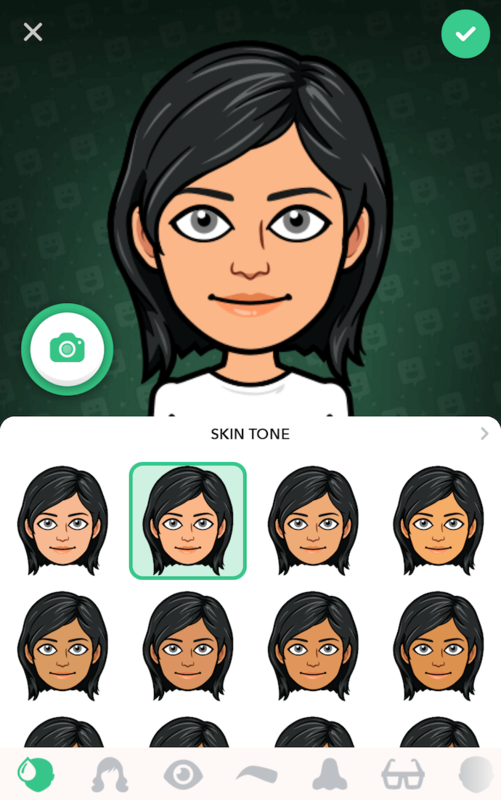 Your personal Snapchat account can help you understand the intricacies and nuances of how real people use the platform -- which will ultimately help you make better decisions and create better content. Once you know the ins and outs of your personal Snapchat account, it's time to create your Business account. To do this, log into Snapchat online and fill out this form. 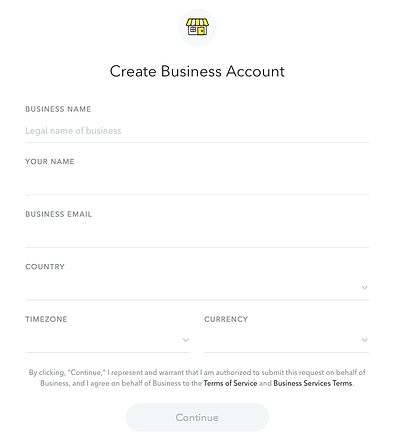 As shown above, this registration form is where you can enter your business's name, your name, your business email, the company's location, and its main currency (e.g. dollars, pounds, etc). Press "Continue" at the bottom and follow the prompts to tether your Business account to your personal Snapchat account and officially launch your page. Here's the truth: Talk to any social media manager and they’ll tell you Snapchat analytics are a pain in the rear. At the end of the day, you’re limited to views ( ), screenshots ( ), and replies. That’s it. Looking at your retention rate (what percentage of people watch each frame of your story) will allow you to compare stories to each other. Which are performing better? 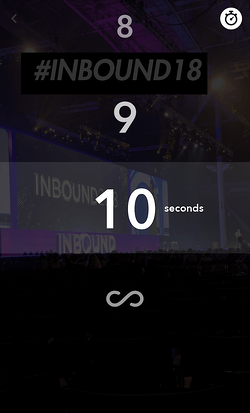 We’ve learned there’s a sweet spot around 90 seconds -- any longer than that, and people start to lose steam. 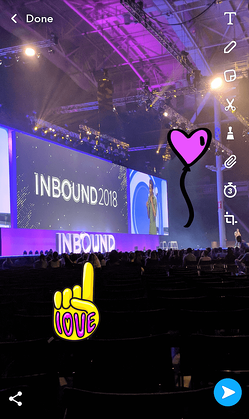 Finding the time to come up with creative, engaging content ideas for Snapchat can be a big challenge -- especially if you're the only person on the job. If you're struggling to gain internal support, you might want to consider explaining how certain teams could benefit from getting involved with the company Snapchat account. For example, our social media team is working closely with the culture team to highlight our company culture. 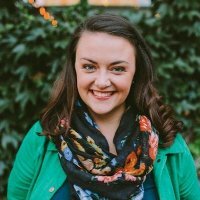 By creating stories that showcase what life is like at HubSpot, they can get the word out about our culture, while also helping us lighten our daily content load. 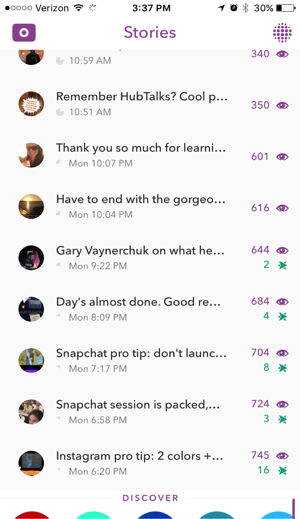 If you want to maintain an engaged audience, it's important that you commit to consistently posting great Snapchat content. What makes a Snap or Story great? For starters: Variety. Snapchat users like to consume stories and information in different formats, and the app provides a lot of room for creative application. 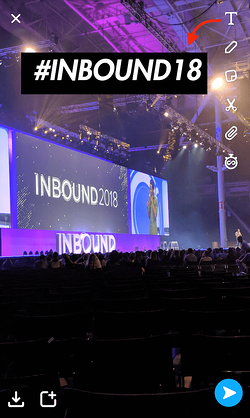 When we launched HubSpot's Snapchat account, we leveraged other company channels -- blog posts, social media, etc. -- to attract followers. As a result, we got some momentum going. Trouble is, keeping that growth moving has proved to be a challenge. 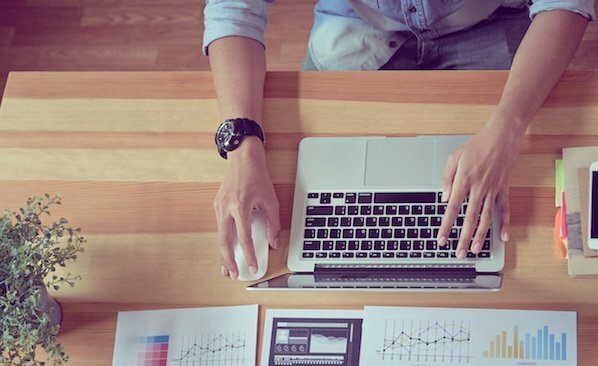 To avoid stalling out once the initial excitement has faded, we recommend developing a long-term promotional plan to keep your audience up-to-date on what's to come. Newsjack. 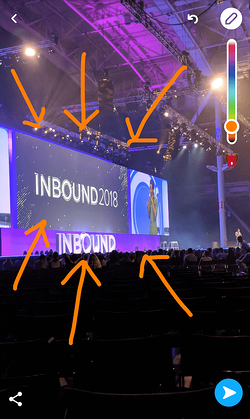 We’ve done a few “HubSpot Hot Takes," which is essentially our version of a quick reaction to industry news. This has gotten our account mentioned by people on other social platforms, which helps spread the word. 7. Don't get too caught up with perfection. Stories should feel quick, off the cuff, and not overly produced. In fact, one of our highest performing stories was just a quick video of me sitting in a chair reacting to a Facebook platform announcement in real time. I saw the press release, ran to an empty room, and fired off a few quick snaps explaining the change. That's it. Keep in mind that the photos won’t be professional-grade ... and they don't have to be. Your focus should be on finding a way to create authentic, compelling moments and stories, so try not to overthink it.